No foreign policy terms in this "book of the week." I read a novel over spring break and I wanted to share it with you. It's really great. "The Imperfectionists" by Tom Rachman. It's a debut novel by a young novelist - a series of interlinked short stories about a group of journalists at an English newspaper in Rome. Brilliantly told. A smart page turner. But a warning: if you are an aspiring journalist, this book might change your mind. This week's book of the week is Great Soul: Mahatma Gandhi and His Struggle with India. It's by Joseph Lelyved, the former editor of the New York Times. It's not a conventional biography. 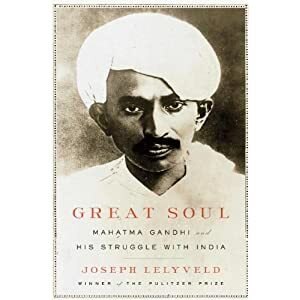 It tells the story of a how a young Indian lawyer went to South Africa politically inactive and was transformed into this great leader of a mass nonviolent resistance movement. How did Mohandas Karamchand Gandhi become Mahatma Gandhi? Brooks is, of course, a columnist for "The New York Times." But don't pick up the book expecting the usual political analysis. It's not that at all. This is a profound meditation on what motivates human beings. What makes them win. What makes them succeed. What makes them love. What makes them relate to each other. It's a lot of neuroscience. Very well presented, wonderfully written. The author is the highly intelligent former Chief of Staff to Britain's Prime Minister Tony Blair. This is actually two books in one: an insider's view of life at 10 Downing Street and the decisions to go to war in Iraq and Afghanistan and a sort of a super self-help book on how to wield power, as the title suggests. Very intelligent. As events in the Arab world have transpired in recent weeks, I've been rereading some of my favorite books on the region. This week, I want to recommend to you Bernard Lewis' "The Middle East: A Brief History of the Last 2,000 Years." It's actually a very short book and it's the single best general history of the Middle East that I've read. Buy it, read it, keep it on your shelf. You'll really enjoy it.